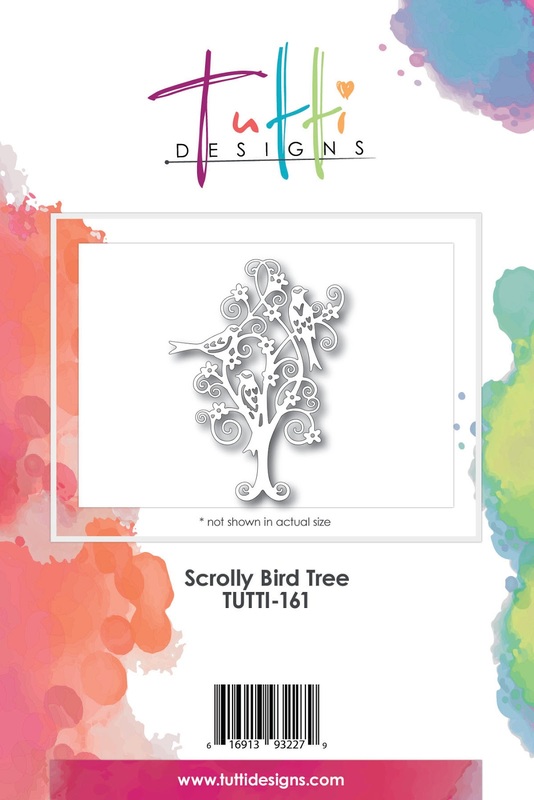 Tutti Designs: Birds in a Tree . . .
Darlene with you today and it's my turn to share a new, inspirational creation using dies from the Tutti Designs Store. Have you checked out this new die company yet? If not, you truly owe it to yourself to pop over to see the fabulous die designs available. They just came out with their 3rd release and keep watching because there is MORE TO COME! For today's creation I chose to use the 'Scrolly Bird Tree' TUTTI-161 die. My mind was going in so many different directions on how I wanted to showcase this die but I settled on something relatively simple and it all began once I die cut the die and started coloring it. As you can see, I decided to color my die cut before actually breaking it away from the card stock panel. I've never colored a die cut this way before but really like how it came out ... actually pretty easy and fun. Then, once I had my die image colored I decided to use the same colors to create a background frame to showcase this lovely Scrolly Bird Tree. By simply scribbling color onto a card stock panel using the same 3 colors I used to color the Scrolly Bird Tree die cut. Using a rectangle die, I created the frame I was wanting to showcase my lovely tree. Leaving me with a coordinating panel that could be used on the inside of my card for the sentiment as seen here. By choosing 'scrolly' styled sentiments, I was able to coordinate the beautiful scrolly design of the Tutti Designs die on my card front with the wording on the inside panel. Sometimes those little details will make the biggest difference in your creations. Don't be afraid to use 'pieces' of your die cuts to use as accents on your creations as I have done here. By simply die cutting a portion of the die onto a scrap piece of white card stock and coloring the 'scrolly' portions with the same marker, I was able to create the 'leafy accent pieces' I needed for my corner floral embellishment. The team has something new to share here on the Tutti Designs Blog EACH and EVERY DAY! Pop over often and see for yourself ... what a talented group of designers!! Great tutorial Darlene! Love your card.